Climate change is beginning to cause disruptions to the monsoon, the seasonal rains which provide water to the Indian state of Maharashtra. This rainfall shortage has multiple detrimental effects, damaging agricultural productivity, and leading to shortages of drinking and household water in rural communities and urban centers. Outdated, damaged, and insufficient infrastructure in the state, both agricultural irrigation systems and water-delivery systems, exacerbate this problem. As rural communities that can no longer support themselves with agriculture move to the overcroweded urban centers, they increase the demands on the infrastructure and economies of these cities. This influx of rural migrants engages in conflict with the established urban populations over these scarce resources. Maharashtran farmers have begun to shift away from the production of cotton, cereal grains, and sugar cane, which all can be produced more easily in other states. The reason for the lower productivity for these crops in Maharashtra “may be due to scarcity of water, poor soil quality, and small landholdings.” (Maharashtra development report 51) Maharashtra is still known for some specific quality cash crops, such as Mahabaleshwar strawberries, Alfonso mangoes, and grapes. 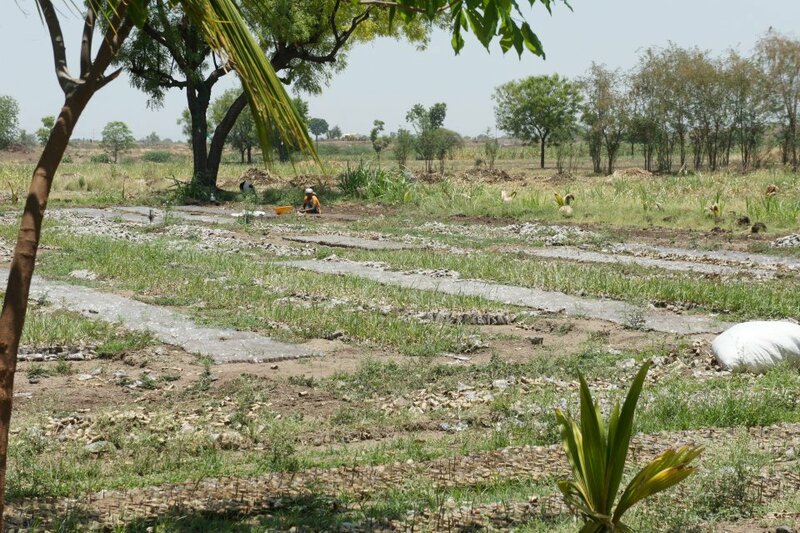 However, these cash crops have also begun to suffer due to unpredictable weather patterns, and lower overall rainfall. The planting season in Maharashtra (and throughout India) is based on the weather patterns (a rainy and dry season) which have existed with little variability for most of agricultural history. Climate change has begun to shift/change these patterns in such a way that farmers can no longer reliably plant their crops. The lack of agricultural viability in the majority of the state is a factor encouraging rural populations (from within Maharashtra and neighboring agricultural states) to move to the large cities such as Mumbai and Pune. The potential for future conflict stemming from these current conditions is twofold. As climate change changes the weather patterns in India, potentially increasing the dry season and limiting the total amount of rainfall, there will first be a conflict between the demands of the major cities and those of the outlying rural areas. Many of the rivers in Maharashtra flow from the interior of the state to the coastal regions, which means they must pass through agricultural areas before reaching the cities, most of which are located on or near the coast. Already there are challenges present in allocating the river resources so that communities at the headwaters of these rivers do not over-utilize these sources, causing them to be drained before reaching communities farther downstream. Another potential source of conflict will be between established urban residents and new migrants to the cities as the current water delivery systems are not able to provide enough water for the massively expanding urban population. Current systems of water-rationing, rain water collecting, and other temporary solutions are not enough to cope with the dual challenges of expanding population and decreased rainfall due to climate change. Maharashtra is a state in western India, expanding from the coast through the center of the country. It is both the largest and wealthiest state in India, and has the second largest population (after Uttar Pradesh). The total population is approximately 112,372,900 people. The combined populations of its five largest cities (Mumbai, Pune, Nagpur, Thana, and Pimpri-Chinchwad) is approximately 21,545,000. This leaves a population of 90,827,900 living in smaller cities, towns, and villages throughout the rest of the state. Reliance on Seasonal Weather Patterns for Basic Water Resources. Change in these Seasonal Weather Patterns due to Climate Change. As climate change is making the monsoons less predictable, the rainfall that this state depends on for drinking, agriculture, industrial use, and household use is insufficient. This problem is exacerbated by the increasing population of this state, both internally and from external migrants to its urban centers. In 2013, Maharashtra is facing the worst drought in over 40 years, after receiving less than 50% of the standard rainfall during the last two monsoon seasons. (Bhalla 2013) This has lead to "6,000 villages have been hit in 123 talukas in over 16 districts that have been declared drought-hit. Marathwada is the worst affected with only 14 per cent water stock available. 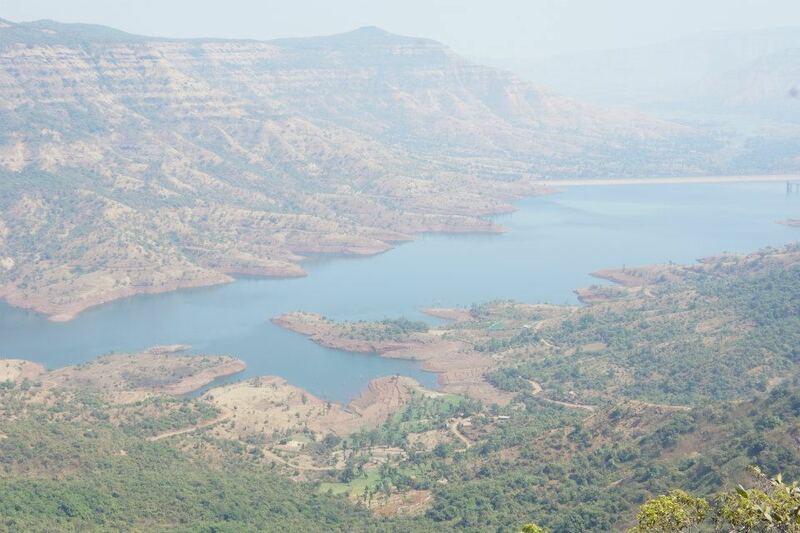 Western Maharashtra's Konkan has the highest water availability at 65 per cent. Nagpur has 48 per cent, Amravati 44 per cent, Nashik 35 per cent and Pune 45 per cent of water stock." (Sen 2013) In the villages, "Drinking water is a serious problem as the normal supply systems such as wells and piped water from the dams (reservoirs) have completely collapsed. 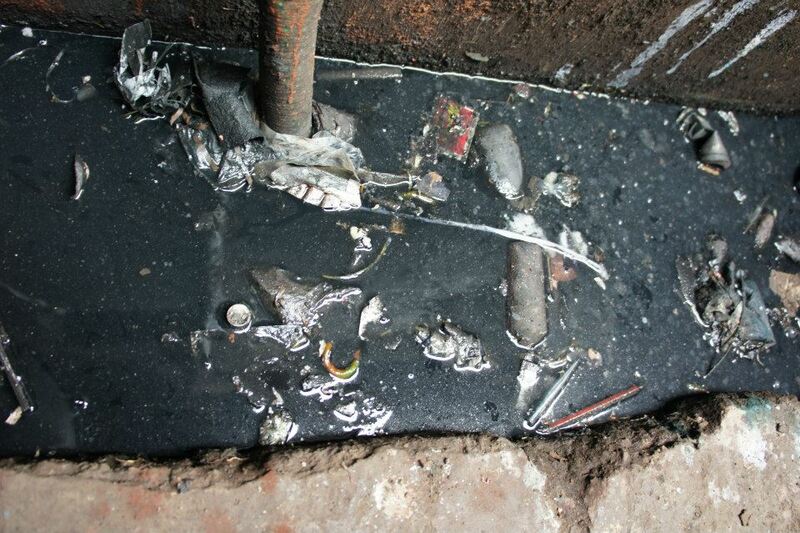 People are resorting to tankered drinking water, but it is not enough." (Bhalla 2013) Without even enough water for consumption, crops and livestock also suffer from these shortages. This has lead to the creation of "cattle camps" where the government is trucking in water and fodder resources in an attempt to care for the cattle that provide milk, dung, labor, and other benefits to the villagers. Cattle are vital for Indian agriculture, but consume massive amounts of resources, both in terms of food and water. This increased drought has lead to challenges as farmers try to provide for their families and their livestock. Maharashtra has a tropical, monsoon climate. Disrupted Weather Patterns exacerbate existing inefficencies in rural, agricultural communities. and also the variety of crops grown in this small area. 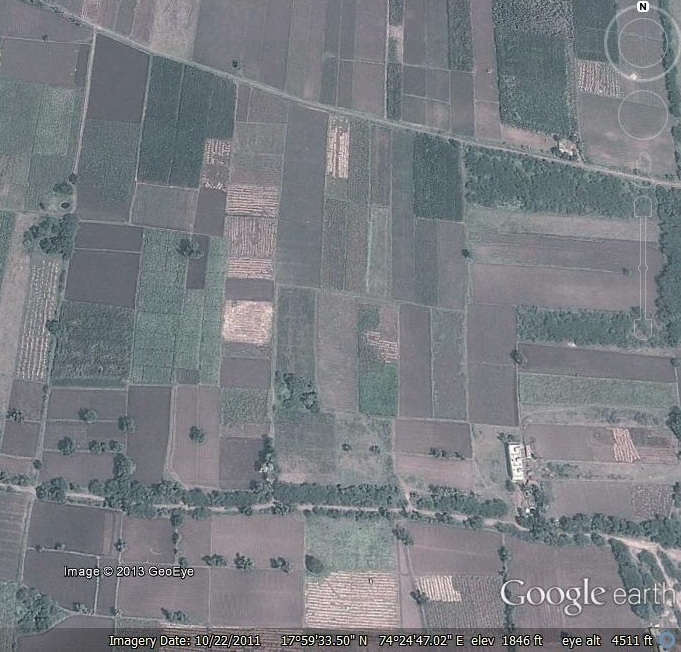 The overlaid image shows a small area of sugarcane fields owned by a local farmer. These particular crops are hand irrigated. In the distance, arid land not being put to agricultural use can be seen. As migrants to the city face hardships, unemployment, and prejudice from urban dwellers, the likelihood of conflict increases. As more migrants are moving to the cities during this current drought, former land-owning farmers find themselves working as daily wage laborers in Pune and Mumbai, where they must fight among themselves to be selected for limited jobs, and also face the risk that "We get work for only two to three days and then the thekedar dupes us and doesn't give us the money. There isn't any water in our villages. 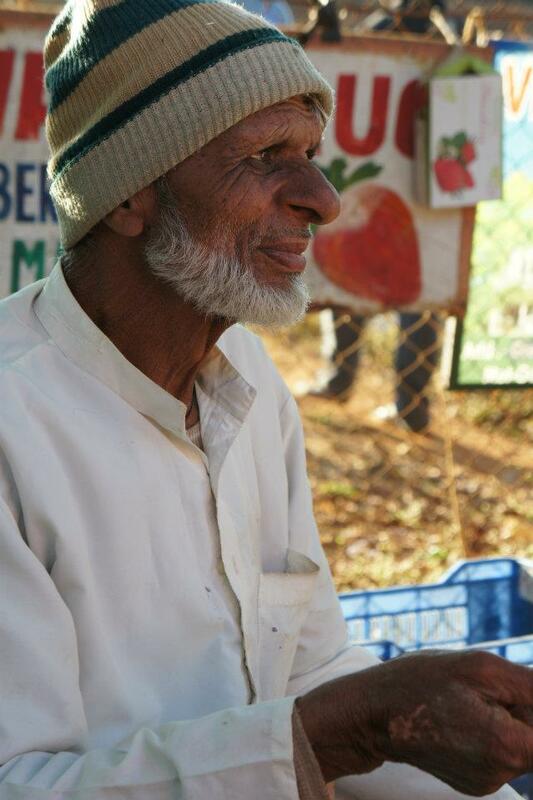 "(Sen 2013)These migrants come to the cities looking for work, and risk being duped by the employers within the cities. The migrants also struggle with high rent, high electricity, and other high costs of living in a city, despite their irregular wages. The migrants who were interviewed in Pune want to move back to their own villages and land, but as long as the dams cannot provide sufficient water, they have no choice but to continue stuggling in the cities. Another potential source of conflict is the allocation of water resources in the state. While some villages lack drinking water, "dams once used to irrigate farmland are increasingly being diverted to service the state's rapid industrialisation. As a result, more water from the dams is going to sugar factories and newly built luxury residential areas complete with golf courses, while farmers are losing out on water for crop irrigation and relying more on erratic monsoons." (Bhalla 2013)Regions with high density of sugar cane processing plants and other industry have significantly higher water usage than more agricultural or residential regions. There are rumors of crime and violence occuring in the villages, even notably one case of a man attempting to murder his brother, claiming they were fighting over water. (IBTL 2013) This dramatic claim is currently unsubstaniated, but similar stories are becoming more common as neighbors begin to fight and steal in an attempt to claim enough water to survive. Internal conflict within cities and communities. Conflicts in these urban centers is often attributed to a number of factors, and can be disguised. Fatalities Currently More Likely from Factors such as lack of clean water and other resources. Fatalities have been attributed to the celebration of Holi, where individuals in Dharavi were killed or hospitalizied after consuming polluted water they mistook for colored water from the holiday celebration. and the destination of many migrants from the rural regions of the state. 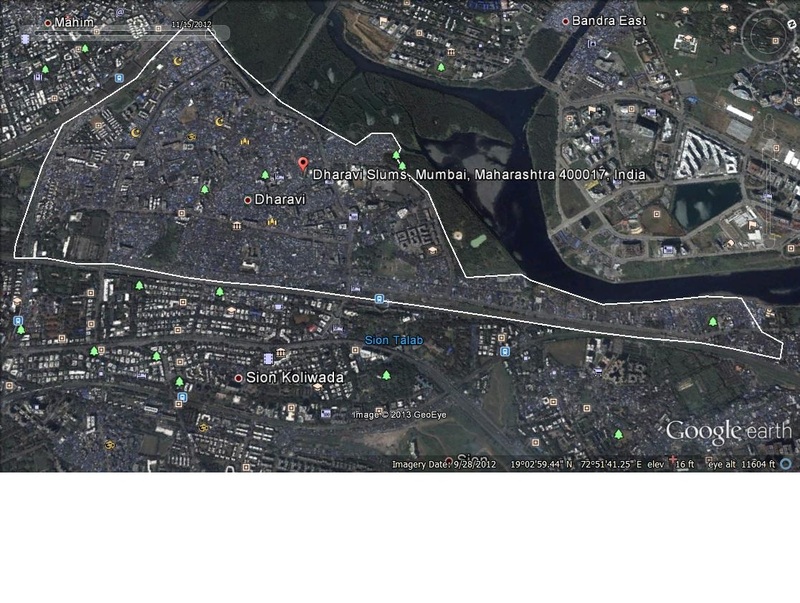 the size of the structures in Dharavi compared to those in neighboring regions. 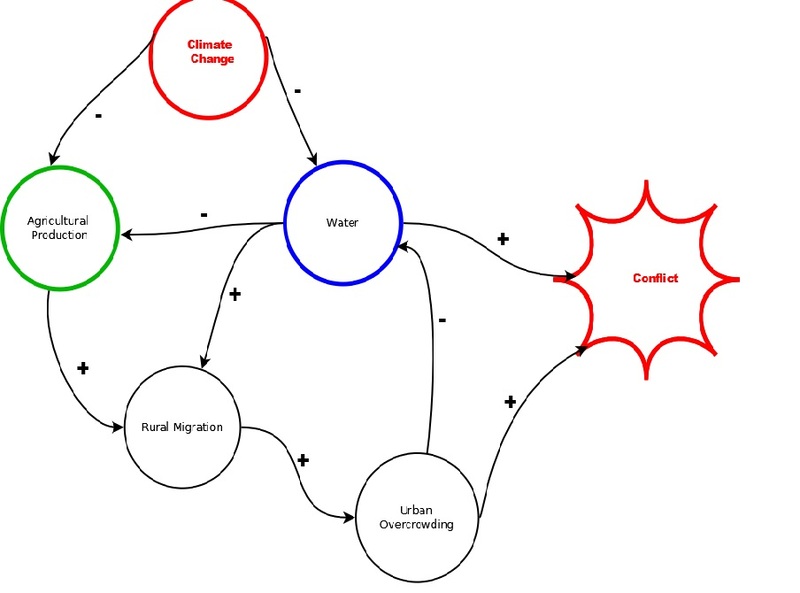 This diagram examines the process that leads from climate change to conflict in the Indian state of Maharashtra, focusing on how impacts in rural communities lead to migration and conflict in urban centers. Climate change is shown to have an inverse relationship with agricultural production and water; this decrease in available water also has a negative impact on agricultural production. This reduced agricultural production leads to an increase in the migration of rural communities away from the areas that are too dry/unproductive to support them. Rural migration leads to urban overcrowding, especially when these migrants live in informal housing. Urban areas do not have the infrastructure necessary to provide for these populations, and with water infrastructure in particular these shortcomings are apparent. Broken, outdated, or nonexistent water systems are unable to meet the needs of cities, causing water shortages and tension between groups of people. It is during these drier periods of time that the underlying conflict between established urban communities and migrants will become more apparent as they compete for limited water resources. It is the urban overcrowding in general, and water shortages in particular that are likely sources of future conflict in Maharashtra. Undecided. While the state of Maharashtra has recently started tracking climate migrants, this does little to address the challenges they face. As drought conditions get worse, without improvements to infrastructure, these communities will continue to migrate and urban resources will be unable to handle the strain, leading to conflict.What remains to be seen is if the conflict will once again fall along state lines, as in the 2008 attacks against migrants from Northern states, or if there will be enough tension to cause violence amongst Maharashtrans.